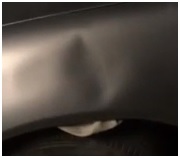 Sometimes vehicle dents can be annoying, frustrating, and expensive to repair. 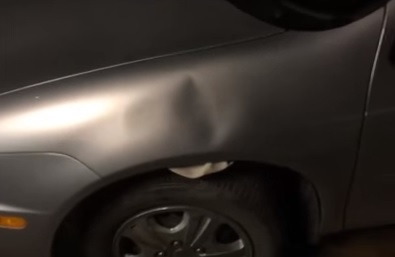 Here is two little tricks you can use when you have one of those dents. Of course not all dents are the same, and not all dents can be tackled the same way. There are those hard to get to dents. 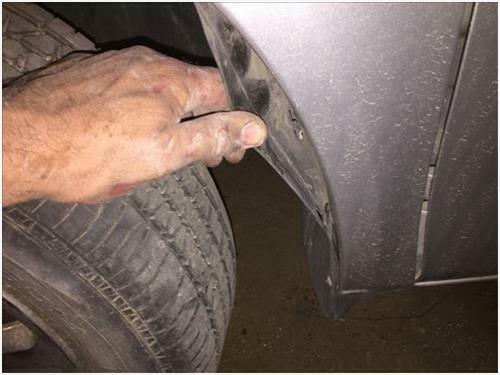 There are those dents that require hours of pounding and stretching metal. Then there are some that require you to replace a complete door or fender. Those dents cannot be fixed using this little trick. However there are those almost perfect round dents that you think man if I could get behind this dent and give it one big smack I could pop that thing right out. Well really you can. So let us try one thing before the actual trick. 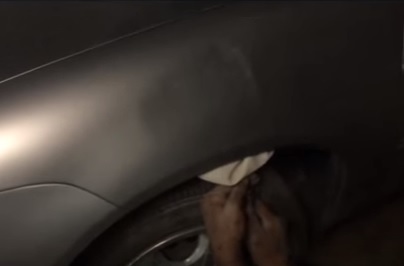 Let’s get the area where the dent is wet, maybe even a little soap as if to be washing the damaged area. Now that it is a little soapy and wet. Try pulling the dent with a plunger. Hopefully this trick works for you, great. 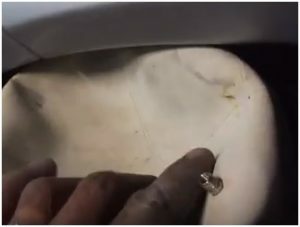 This method will do wonders on small very flexible dents. If it did not, then you need my little trick. 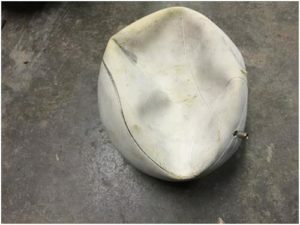 So first remove anything in your way from accessing the back of the dented area. No matter the amount of room, just get some room. In this picture I have removed the wheel cover above the tire. You just need to remove a couple small screws. I did not need to completely remove it. I removed Just enough so that I may get a couple inches of space behind the dent. In some cases like a door that has a dent, you may need to remove the door panel on the inside. Now take a ball needle that you would use to put air into a ball and place it into a ball letting all the air escape from the ball. You may need to step on the ball to get it as flat as possible. Then push the ball in behind the dent. Make sure that you leave the needle exposed so that you are able to put air into it. In some cases when the ball requires being shoved way back. You can attach the air line as well using a valve to input the air. At this point you can also use a bicycle tire pump as well. The ball will only need about 5 lbs. After you have seen the dent pop back out, you can deflate the ball and retrieve it. 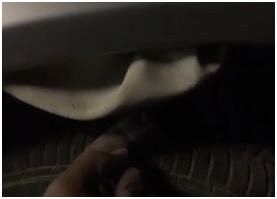 Then replace any screws you have removed in the wheel well or door panel. There was no chip in this paint just a large dent. As you can see after doing my trick, there is still no paint chipping and the dent is gone. So as you can see with just a ball needle and a ball, you can become a body man. My personal favorite ball is the red kick ball also known as the play ground ball, we used as children on the playground. They fold up easily and are very easy to get into some tight spots. And in cases where needed they can stick out half way and still do the trick because they are so much more flexible. So in short, some dents are better left to the professionals, but there are some that are worth doing ourselves. Thank you for the tips! This will help out a lot. Very cool. Thanks for the tips. Great auto repair blog. WOW! Cool tricks. I might try this when I got dents. Thank you for this. Thank you for these tricks! I have used the inflatable ball dent trick before. I was able to use a tire innertube to repair the dent. I found the innertube was easy to get inside the dented area, and didn’t slip out as it was inflated. But I found when using a plunger, you really need to use a new plunger- as they get older, the rubber loses its ability to create a tight enough vaccuum seal to pull the dent.